Well, that came around quickly, didn't it? We are already well into the final month now, so let's see how those competition entries are shaping up! Again, instead of showing the status of all the games (several of which have now been finished and submitted) I'll only be highlighting those with recent changes or news. The previous status updates can be found here and here. I recently received a build of Phase Out and I have to say that I'm really impressed. With outstanding music, beautiful graphics and well considered puzzles to solve, it's clear that a lot of work has gone into getting the most out of that 16KB limit. Ernst is now completing work on the password system for the 50(!) levels, and has assured me that this one will certainly make the deadline. With only three weeks to go, that news is reassuring. 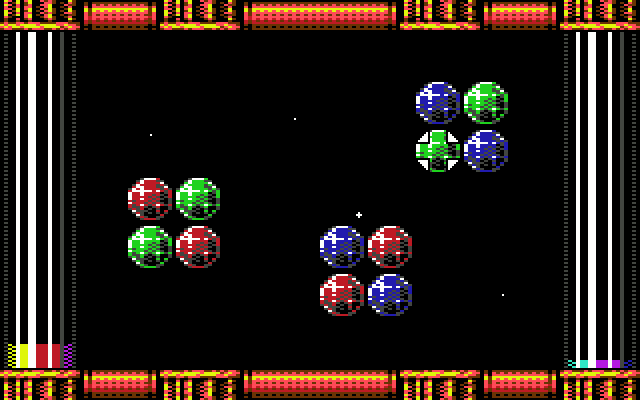 Your goal in Phase Out is to clear each screen by swapping the position of the coloured gems 'match-three' style, although in this case it's 'match-two-or-more'. To make things a little more interesting, the black gems can't be cleared and must instead be used to block gems from cancelling each other out whilst you move them around. It's challenging stuff, and you'd better not run out of time or the C64 will reset! Work continues on Bellringer III, with the latest build featuring some superb enemy AI and projectile based combat. The game now depicts a realistic impression of a medieval castle invasion, with archers that aggressively pursue and fire at you, charging knights and - uh - guys who empty their bed pans onto your head as you pass beneath their windows. That bit of medieval Europe always sucked. There are pick-ups to collect and the titular bellringing end of level puzzles are now fully implemented. When recently discussing his project, Geir explained that he is "still working on the game (primarily level design now), and waiting for music and/or sound fx from Sean." With sound and music being the main issues holding back this release, here's hoping that it all comes together in these final few weeks! No new screenshots sadly, but I did manage to briefly get hold of Jason between his work on Retro Gamer Magazine and completing his recent 8-Bit Atari shmup project. "The working title Cybernox has been dropped in favour of Vallation and I've added a few new graphical details and will be starting on the levels in the next couple of days if all goes well; there's still some bespoke code for specific enemies that needs doing once their sprites are drawn as well as a few more odds and ends for the completion screen and the title page to write on the code front after that. It is, generally speaking, going to be a bit tight so don't hold your breath but I'll have a go..."
All I can say to that is good luck man! 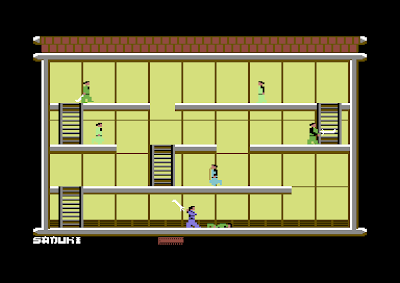 It's been a while since we've seen a C64 release from Cosine, and this one certainly looks worth the wait (crosses fingers). To be honest I should probably list this one as complete and submitted, but - time permitting - John is still hoping to work on his and Saul's release further before the approaching deadline. "I believe (Rocket Smash) is working and everything is fine. I planned on expanding on the sound effects routine but I just haven't gotten around to doing it. I hope I can get it in before the compo end, and then of course make it a part of the full 64KB version as well. There is a tiny screen change glitch from the high score entry to the main menu screen again in the 16KB version that I was also planned on ironing out." 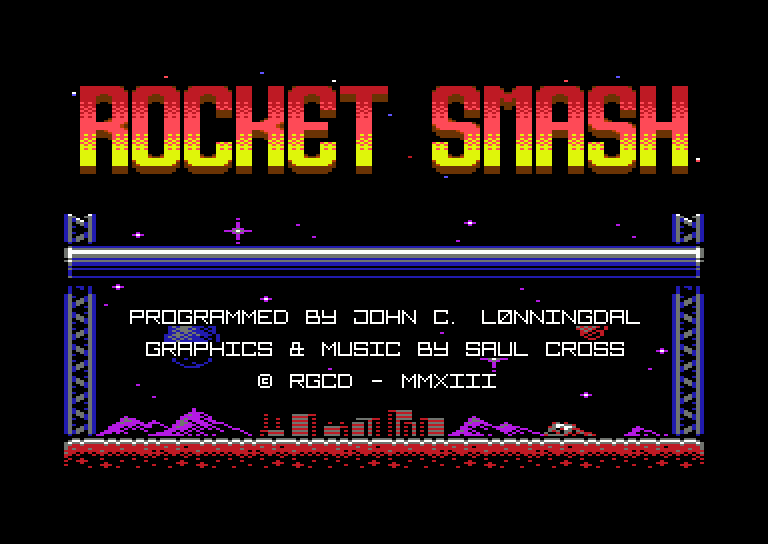 So these two (very) minor issues aside, Rocket Smash is finished. Well done guys! Again, no new screen shots or builds received since last time, but Matt wrote to advise that work is still continuing on the game and he hopes to meet the deadline. Having played Powerglove quite extensively, I really hope so too - it's a unique little game with a proper old-school console feel. Frustratingly, Matt explained that he is "still having three major problems, but (has) just received the final soundtrack from Cyborgjeff. Just great! Just great! Motivation rising..."
I've put him in touch with Dr. Martin 'enthusi' Wendt in the hope of getting any issues resolved (guys - it IS ok to ask for help) and I'm eagerly awaiting good news. 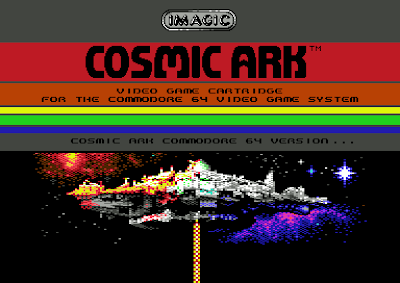 For a while it looked as though Cosmic Ark wasn't going to make it, but Max Hall has now submitted a final build. The main issue that he had was in getting the game running from cartridge - Cosmic Ark was written entirely in the VICE monitor, which is not the best environment to use when attempting to rewrite whole sections of a game so that it boots from cartridge ROM. Fingers crossed, the issues he had have now been resolved (we'll find out for sure when testing on real hardware). This previously Atari 2600 exclusive title from Rob Fulop has you descending to the surface of increasingly hostile alien worlds, navigating past planetary defences, avoiding meteors and abducting pairs of critters for preservation on your ark. 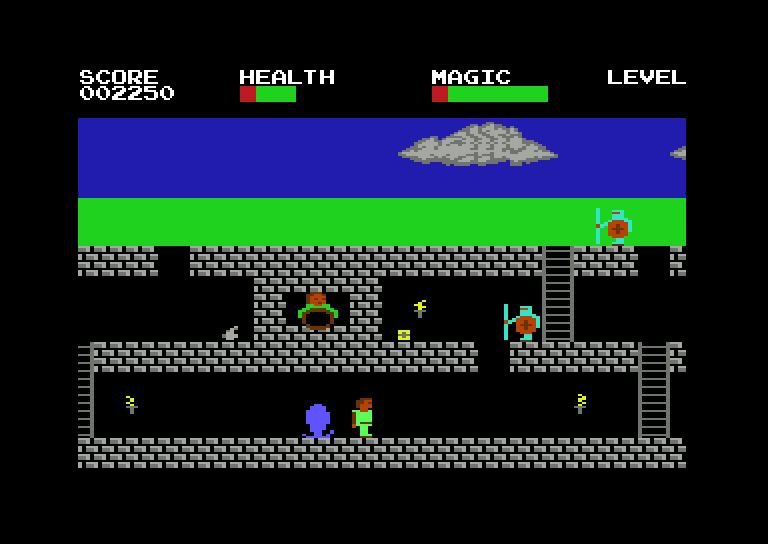 As with the original, the C64 port features the meteor defence mini-game between stages and despite featuring the occasional (and at this stage potentially unfixable) bug, Max has succeeded in capturing the Atari 2600 feel whilst bringing it up to the standard of a mid 1980's commercial C64 release. 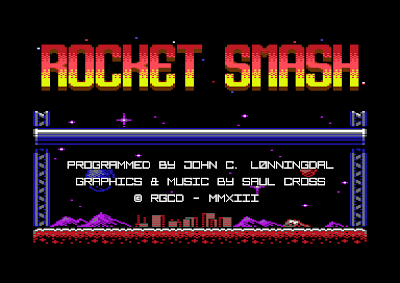 Oh, and the minimal deep-tech title screen music is unsurprisingly awesome too. Despite the clues given previously, no-one saw this coming. 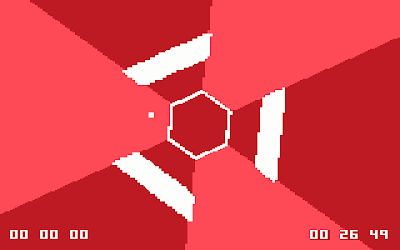 Yes, that's right - Micro Hexagon is an official Commodore 64 conversion of Terry Cavanagh's acclaimed indie hit Super Hexagon. It really shouldn't be possible, yet here it is, in full 8-Bit glory. Well, almost. For those of you who've never heard of Super Hexagon, the game is an insanely-paced vertigo/sickness inducing vector-based avoid em up where you have to navigate your cursor through a maze of hexagon-based wall formations that rotate and shrink towards the centre of the screen. With the C64 being extremely poor at handling vectors, the main obstacle to overcome was in how to represent this using sprites, but Paul has amazingly managed to closely emulate the feel and appearance of the original game despite the limitation of only being able to display five wall sections at a time. The main draw to playing the original Super Hexagon was arguably the amazing soundtrack by Gameboy musician Chipzel, and Mikkel has not disappointed with his SID conversion. But that's not all. In a recent discussion Paul explained that he is "still working on size reductions - at least now the sprite mirroring works correctly and I'm at ~14.5KB. My goal is to get somewhere close to 12KB so that I can include a 4KB sample." Say what? Sampled speech in a 16KB C64 game?!? When asked for an update on their MonsterBuster game, Stefan replied with just one line of text - a url to the video above. As you can see, MonsterBuster looks to be very close to completion, with the video promising amazingly smooth action and classic game play. Oh, and the way the monsters queue up to be shot out of the cannon is both super cute and an effective way of allowing the player to plan their next move. Add some music and MonsterBuster will be absolutely perfect. "Hey! I'm a terrible drop-out :( Sorry about that, stuff got complicated and I ended up travelling for 2 months. Maybe next year!" Back on a positive tip, the already awesome looking C64 conversion of Kobo Deluxe continues to get better and better. Kajtár Zsolt has completed work on the password system and is still planning on making further improvements, time permitting. To be honest I'm not that worried if he calls this one complete in the current state as it's surpassed all my expectations of what a C64 version of Kobo should be. And finally, we have news on Georg Rottensteiner's official conversion of Devil Ronin. "Smila (has) touched up the horse graphics, and a few animation frames from enemies have been cut to gain free memory. He will probably throw in a few background tiles as well. This is the gameplay as I wanted it. Randomized scenes, and you have to fight your way upwards through the map." 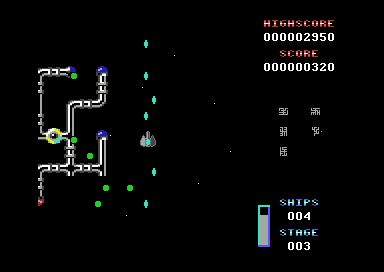 Similar to Georg's 2012 entry Wonderland, Devil Ronin is an ambitious project for a 16KB cartridge - part platformer, part shmup, it is essentially two games in one. Oh and it also features a map screen that acts as a stage select. Crazy stuff. The game is essentially complete now, just needing a few minor final tweaks and some audio from the ominous sounding Mr. Death of Genesis Project. So that is all for now. Still no word from David Eriksson regarding his entry (The Blob), which is a shame, but it's not totally unheard of for silent entries to still make the deadline. All in all, things are looking quite promising for the final line up and it's going to be a lot of fun putting the games through their paces to determine a winner.